LONDON -- London police are investigating after six people were injured by a "noxious substance" thrown during a fight at a shopping mall. 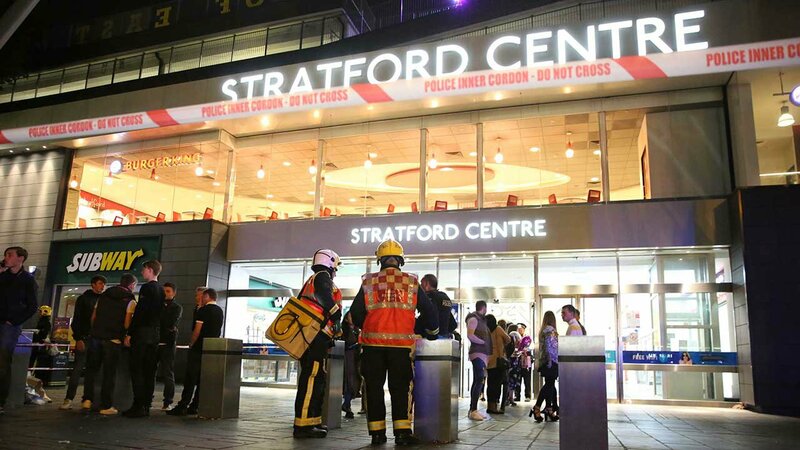 Saturday's incident at the Stratford Centre in east London was not being treated as terrorism-related, London's Metropolitan Police said. "What initially may have been perceived as a number of random attacks has, on closer inspection, been found to be one incident involving two groups of males," Chief Superintendent Ade Adelekan said. The groups fled the scene after the liquid was thrown, some into the nearby Stratford train station, the Met Police said in a statement. Six males had been hurt, the statement said, but none of their injuries were "life threatening or life changing." A 15-year-old male has been arrested on suspicion of grievous bodily harm and is in police custody, the Met said. "I recognize the lasting impact on victims of corrosive substance attacks. Our response to such attacks is continually improving through training and joint working with partners and we are working with the Home Office to explore possible restrictions around the sale of corrosive substances in conjunction with retailers and manufacturers," Adelekan said. The London Ambulance Service said it was called to the scene just after 8 p.m local time. "The first of our medics arrived within 10 minutes of the first emergency call and worked closely with our colleagues from the Metropolitan Police, British Transport Police and London Fire Brigade making sure patients received the medical help they needed as quickly as possible," spokesman Paul Gibson said. "We treated a total of six patients, three of whom were taken to London hospitals." The ambulance service's hazardous area response team -- which provides medical care in hostile environments -- was involved in the response, Gibson said. Imran Tahir Rizvi told the UK Press Association he heard someone shouting about an "acid attack" before he saw a young man on the floor screaming. "His fellows were shouting at police for something. Initially people thought like it was a fight. But the guys (with) the victim started shouting 'it is an acid attack, he is burning'," Rizvi said. A Burger King employee, who would only identify himself as Hossen, said he saw a local homeless man ran into the restaurant's bathroom "to wash acid off his face," the PA reported. "There were cuts around his eyes and he was trying to chuck water into them," Hossen said. Stratford Centre is near London's Olympic Stadium and across the street from Westfield Shopping Centre, one of the largest shopping malls in Europe.